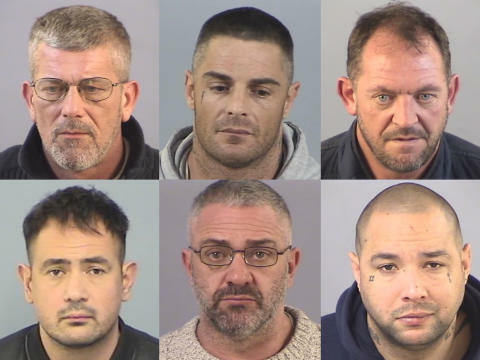 Six men have been jailed for their part in the kidnapping of a 36-year-old businessman in West End in January 2017. The six men appeared at Winchester Crown Court on Monday, 1 October where they pleaded guilty to kidnap and assault causing actual bodily harm. They had previously been convicted of conspiracy to false imprison following a trial at Southampton Crown Court in October 2017. Detective Sergeant Steve Kelly from Hampshire Constabulary’s Serious and Organised Crime team, said: “Richard Baker was at his place of work at the Seddul Bahr Industrial Estate, Allington Lane when the six men entered and made demands. “He was assaulted and threatened, then taken to an address in the Woolston area and on to a pub in Bitterne as the gang tried to gain information from him. Mr Baker was subjected to a violent ordeal; he was punched and had a screwdriver put up his nose. “Having been taken back to the industrial estate, Mr Baker saw an opportunity to escape. He ran and hid under a nearby caravan before calling the police. “We would like to thank Mr Baker for his courage throughout this process. He has been incredibly strong to stand up to Harkins and his gang; without this strength we may not have been able to secure these sentences.